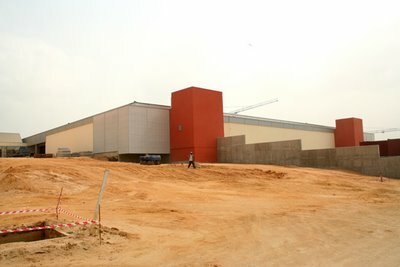 I was taken on a tour of Tinapa yesterday by the project manager (he works for Arup). The experience was a little underwhelming - not surprising given that it is merely a large scale business park. There is no 'wow' factor at all. I expected a vantage point over the whole area, but there doesn't seem to be one. Imagine being taken on a tour of an Amazon logistics warehouse, then photoshop the background with tropical plants, and you get the idea. Talking of Amazon, I mentioned the possibility of it being the ideal base for them to penetrate West Africa. From his response, it seems like it was the first time the idea has ever been mooted. Very strange, given the complete lack of access to books in the sub-region and the size of the untapped market. Most of the space is devoted to wholesale warehousing (as in the image to the left), with a strip of retail between the huge sheds. The only cover for the retail strip is a row of palm trees - not the best choice for providing shade or shelter, given the hot sticky climate and the very heavy rainfall for several months of the year. I would have covered the retail strip with canvas, or used more shade-providing trees (palms are among the worst - as the City of Los Angeles has just decided). So the entire effect will be less Bluewater (or Sun City, let alone Dubai) and more TNT logistics operation. Architecture there is not. For launch in March, there will only be one hotel up and running - a 2-star South African chain with only 200 rooms. So the effect (combined with the Casino and fast food joints) will be quite down-market. I might have started with a higher class hotel - as all brand experts know, it is easier to create lower niches for sub-brands, rather than try to raise a sub-brand above the level of the main brand (think Mercedes A class). Still, it is early days for consumerism in Nigeria, and people seem to love downscale brands (Argos and Primark are held in high esteem by many). I'm sure it will be successful, and more than hit the initial target of 10,000 visitors per month. It's not finished yet, which would explain the lack of "wow factor". Furthermore, there are 2 more phases which would encompass wildlife projects (a crocodile farm and a drill monkey rehab center). I think once the grass and landscaping are finished and the tenants and huge retail areas complete, we will start "wowing" ! We've got to remember this is a state that was NOWHERE 6 years ago and now everyone wants to go to CRS to shop n relax. Nontheless, the availability of international brands in Nigeria from clothing to spirits in an organized and safe fashion will come as a relief to many locals who can't afford to travel abroad. I also heard the emporiums will cater to traders who supposedly will shop til they drop then sell their stuff at places like Aba, Onitsha, etc. Did I mention the cinemas and casino? can't wait to watch Casino Royal! PS. re Filming Studio, u mentioned the owner is an Israeli company, any idea who might that be? Of course it will look better when it is finished, but with such huge drab sheds and no real mall experience, plus a low-class motel - its not something to get too excited about - can't imagine a wow factor now or in future. Rubbing shoulders with Aba market traders on a spree will re-inforce the downscale feel! There is no anchor department store (at least right now). The main design flaw however is the open-air shopping strip - which won't work too well in the rainy season. They should have covered it. I'll try to find out who the Israeli company is.. I wholeheartedly agree that 4-star hotel would have seemed more glamorous (Golden Tulip, Sheraton, or the like). I don't know why Duke didn't manage to infuse some mid-high end brands in this...probably due to high risk factor for investors. Southern Sun was convinced and brought on board, and I bet their market segment is Nigerian mid-end customers (say $75-100/night). About the architecture, I also agree that there isnt any in this phase. In fact I requested an investors brochure back in late 2004 and Tinapa Business Resort Ltd. sent me a fancy CD with some amazing sketches of how the buildings would look and feel when complete, with some photos of precedents in South Africa. There was an emphasis on natural materials, bamboo, straw roofs, more lush vegetation, and overall "organic feel". Yes, there was a provision for deep wooden canopies screening rainfall (looked beautiful and in theory the whole concept seemed like a tourist magnet by itself). Sadly and evidently this has not materialized and the investors opted instead for a utitalitarian approach (lower cost): metal roof, concrete structures, and CMU walls, gypsum, etc.However and to give them credit the roads are EXTREMELY well designed and executed (well drained, sidewalks, and landscaped). The lineshops are totally glazed for a contemporary feeling. Isn't it ironic how "green architecture" today is more expensive than post-modern construction. The entertainment complex is under construction (so is the waterfront restaurant and boutiques) hopefully those will be a bit more creative and African/natural- styled. Wow a Calabar-Lagos road...now that will be something!!! pls tell me whats the level of construction on the lake and the entertainment center.i have been so enthusiastic about the project all this while but ur recent assessment of the project now makes it look low profile to me.will it be right if i assume a less "wow" lookout for this project from ur estimation.